but we fear what accompanies them -- snow. Labels: still life. watercolour. Be Here Now. 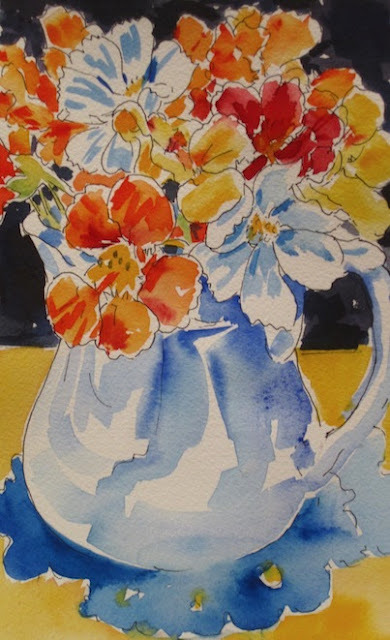 Barbara Muir © 2012. garden flowers in a milk jug. Toronto. Canada. This is just beautiful Barbara! I've been looking at the manic nasturtiums in my window boxes and feeling they need to be painted too...maybe soon. Hey Barbara your flower painting is so excellent really...I like the way you playd with the colour collection there....very amazing indeed. Mine are mostly leaves. I have to learn how to get more blooms, but even still there are plenty of flowers to pick and paint. I am not that easy on the bugs full time, but every now and then it hits me that we are all just creatures. Then normalcy returns and look out bugs.